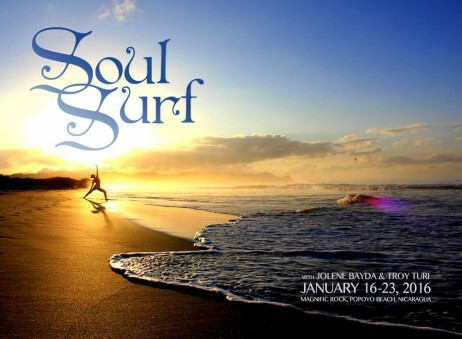 Sorry, this retreat is Soul’d Out! This surf and nature lover’s paradise is perched atop a coastal landform that overlooks the ocean atop a 270 degree view of the Pacific Ocean’s coastline. 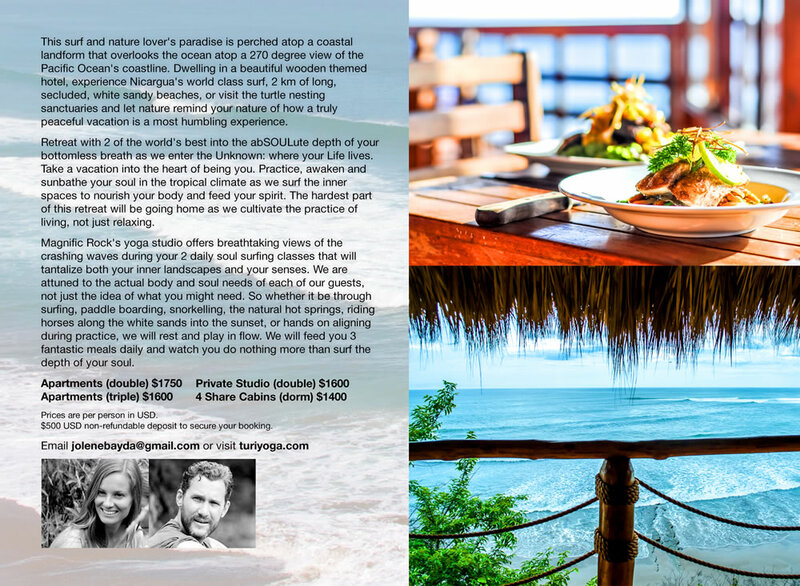 Dwelling in a beautiful wooden themed hotel, experience Nicaragua’s world class surf, 2 km of long, secluded, white sandy beaches, or visit the turtle nesting sanctuaries and let nature remind your nature of how a truly peaceful vacation is a most humbling experience. Retreat with 2 of the world’s best into the abSOULute depth of your bottomless breath as we enter the Unknown: where you Life lives. Take a vacation into the heart of being you. 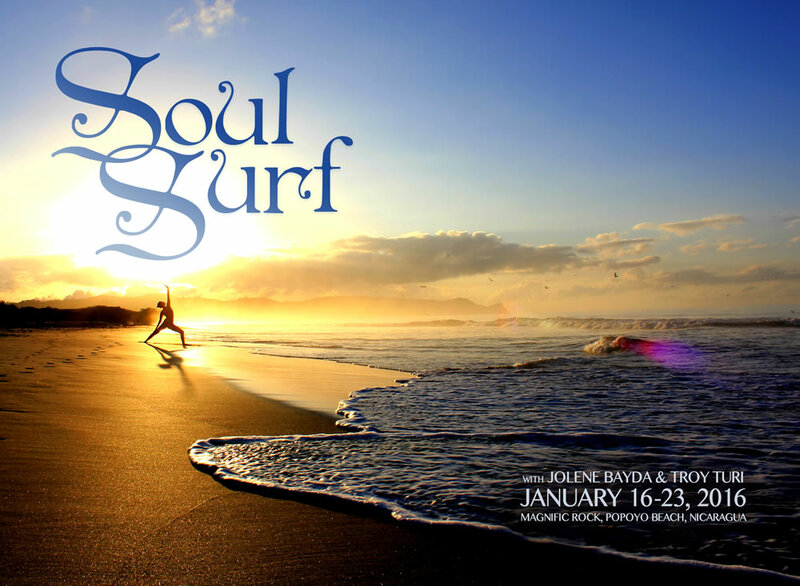 Practice, awaken and sunbathe your soul in the tropical climate as we surf the inner spaces to nourish your body and feed your spirit. The hardest part of this retreat will be going home, as we cultivate the practice of living, not just relaxing. Magnific Rock’s yoga studio offers breathtaking views of the crashing waves during your 2 daily soul surfing classes that will tantalize both your inner landscapes and your senses. We are attuned to the actual body and soul needs of each of our guests, not just the idea of what you might need. So, whether it be through surfing, paddle boarding, snorkelling, the natural hot springs, riding horses along the white sands into the sunset, or hands-on aligning during practice, we will rest and play in flow. We will feed you 3 fantastic meals daily and watch you do nothing more than surf the depth of your soul. $500 USD non-refundable deposit to secure your booking. Email jolenebayda@gmail.com for more info. $500 USD non-refundable deposit required to secure your booking. Payment by VISA, wire transfer or bank draft. Please contact Troy & Jolene for details.